Be the first to share your favorite memory, photo or story of Raymond "Ray". This memorial page is dedicated for family, friends and future generations to celebrate the life of their loved one. 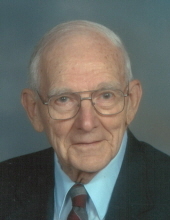 Raymond “Ray” J. Dell, 100, of Fostoria, passed away at 5:25 am Sunday April 7, 2019 in Fostoria. He was born on Christmas Day, 1918 to John M. and Ada (Marks) Dell. He was delivered in the 2nd floor apartment at 224 ½ S. Main St., above what is now known as Dell’s Fine Foods. He was fortunate to be able to celebrate his 100th birthday at Dell’s Restaurant with family and friends. He owned the restaurant from 1934-1982. Ray entered the first grade at St. Wendelin grade school in 1925. In 1934, when prohibition ended, his father John bought the building at 224 S. Main and opened Dell’s Restaurant & Bar. Ray graduated from St. Wendelin High School in 1937. He had worked in his dad’s restaurant during high school and continued to do so after graduation. Ray met his future wife, Mary Hagley, of Carey at a basketball game in Carey in 1939. They were married in 1942. Shortly thereafter, Ray was drafted into the Army and marched off to Europe, serving in a grave registration unit. He and his few soldiers recovered and buried hundreds of fallen fighters both American and foreign. At various times, he served in Germany, France, England, Belgium, Holland and Luxembourg. He was discharged in 1945 following the war’s end. Back home in Fostoria, Ray resumed working for his father. When John died a few years later, Ray and his brother Joe took over the business, ably assisted by their wives and some hired help. When Joe Dell died in 1982, Ray and Mary decided to retire. Over the years, Ray attended many sales and auctions in and around Fostoria. He was an avid collector of almost anything old, particularly if it related to Fostoria. He has an extensive collection of old Fostoria photos and postcards and other local items of interest. In 2018, at the age of 100, Ray was still driving his car, mainly to Dell’s every day for coffee and conversation with friends and old customers. He was an avaricious reader, visiting the local library two or three times a month. He especially enjoyed stories about World War II. Surviving is a son, Rodney J. Dell of Lady Lake, Florida and a daughter, Deborah A. (George) Welly of Fostoria; eight grandchildren, Toni (Garry) Stevenson, Indianapolis, IN, Tina (Brian) Gorka, Galena, Michael (Nina) Welly, Chicago, IL, Randy (Patti) Dell, Crozet, VA, Ryan (Allison) Dell, Brookfield, CT, Elizabeth (Kenny) Barnum, Plantsville, CT, Stephanie (Keith) DeMaggio, Worthington and Matthew Barringer, Lyndhurst; and 11 great-grandchildren. He was preceded in death by his wife Mary (2009); daughter, Ginger Baringer (2016), grandson, Todd Welly; brother, Joe Dell; and a sister, Lenore Blaser. Visitation is Wednesday April 10, 2019 from 5-7 pm at HOENING FUNERAL HOME 242 W. Tiffin Street, Fostoria. Mass of Christian Burial is 10:30 a.m Thursday at St. Wendelin Catholic Church with Rev. Todd Dominique, presiding. A rosary will be prayed at 10 am at the church. Burial will follow at St. Wendelin Cemetery with military honors being provided by the Fostoria United Veterans. A lunch for family and friends will follow in St. Wendelin Parish Hall. Memorials are suggested to the Fostoria United Veterans, St. Wendelin Catholic Church or ProMedica Hospice. To send flowers or a remembrance gift to the family of Raymond "Ray" J. Dell, please visit our Tribute Store. "Email Address" would like to share the life celebration of Raymond "Ray" J. Dell. Click on the "link" to go to share a favorite memory or leave a condolence message for the family.